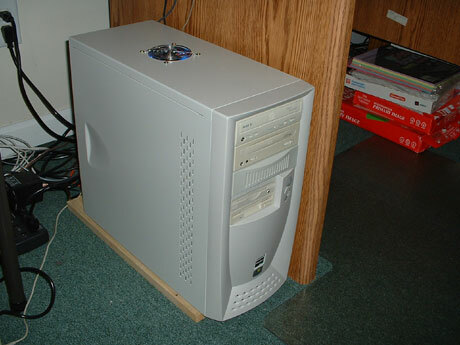 My wife’s machine: Athlon 2500+, Asus A7V8X-X, 768M Crucial PC-2700, WD-80G SE, all inside a generic white-box case. 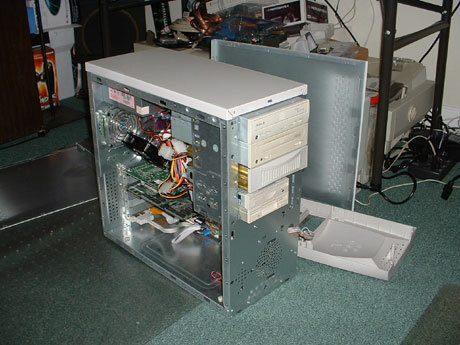 (SuperCase 7C225-034) All in all a pretty decent machine, but in need of modification. 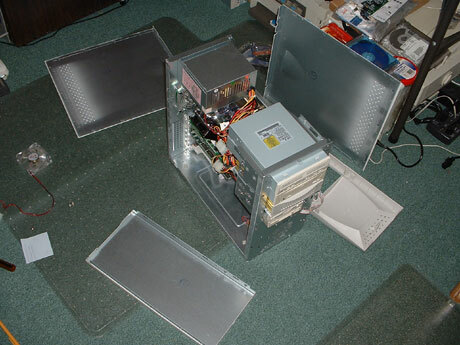 I had an extra set of duct modding components, an HDD freezer, and some extra fans left over from a few other projects. However it would take more than that to tame this case and prepare the system for serious performance. The duct mod is nearly identicle to the one I installed in my other system. It was fairly warm, but I knew the HSF should’ve been performing better. 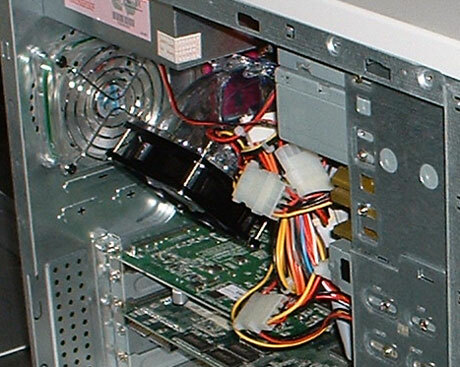 The power supply in this case was listed as being on the AMD list, but I noticed that it didn’t have the extra fan required by AMD. This causes heat in this case to pool in a dead space at the top, which kept the air hot and worked against the HSF. This type of problem is common to a lot of case designs. The solution is a simple mod called a blowhole. I used a pencil to mark where the PSU ends, and removed the top panel of the case. 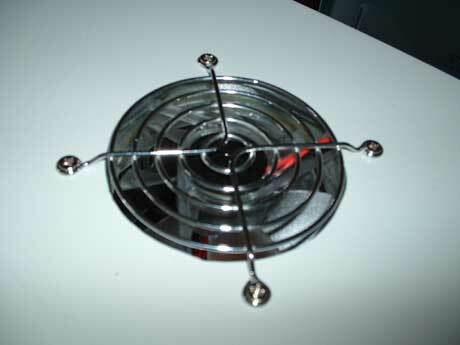 I positioned an 80mm fan where the hole would be, and traced it on the underside. 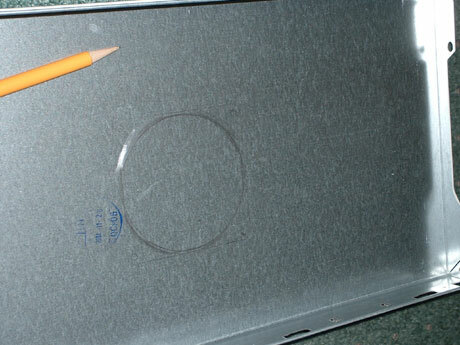 I marked both the screw-hole locations and traced the interior. I then drilled the holes and cut out the center with a reciprocating saw. A little sanding, some silver fan screws and a grille combined to make a decent looking finish. The blowhole worked like a charm. 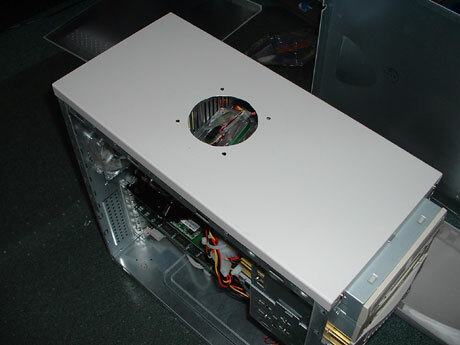 With the exhausting of the hot air at the top of the case, the duct mod kept the CPU at a cool 48°C. It even stayed there with the room being fairly warm. 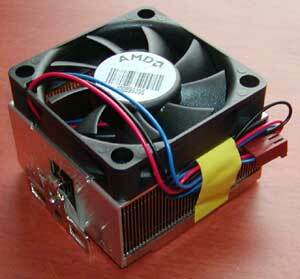 While this doesn’t bring us to a place ripe for serious overclocking, a little may be possible. We’ll soon see!